Today I plan to showcase how I made the base for my Railless Interceptor (due out in November on Black Friday). I used this same process for all of the other bases I’ve placed my Crucible Guard on. For the purpose of this tutorial, I’ve broken this process down into four simple steps. To start off, I broke up pieces of bark and roughly fit them onto the base. You will want to test-fit your model to make sure you’re happy with how the model stands on the base. Once you have all the bark in place, secure it with P3 Super Glue. Step 2: Adding Some Junk! 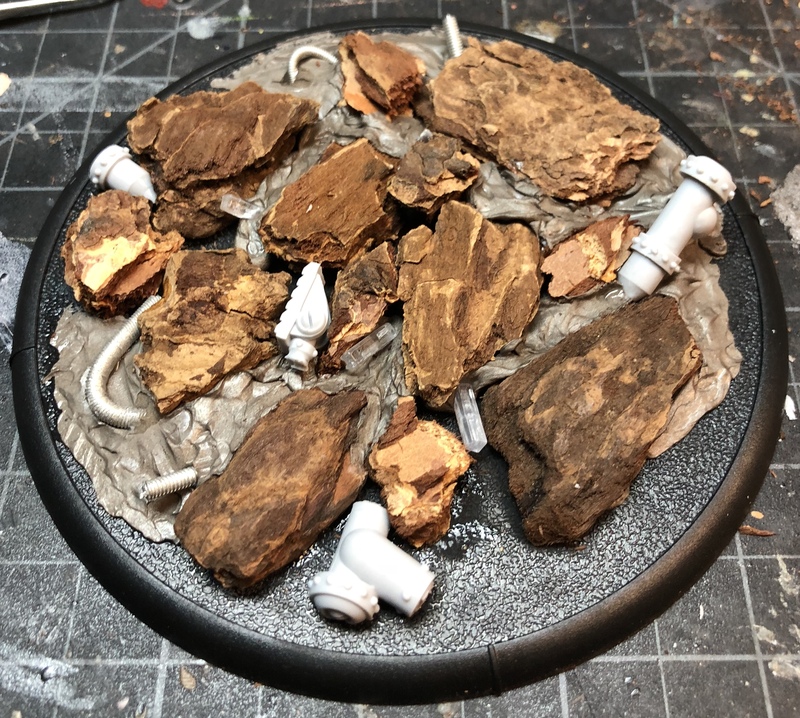 To fit with the junk-filled wasteland theme, I wanted to add some rusty metal pipes or sheet metal to the base. I keep a bin of older parts from WARMACHINE kits, as well as some styrene sheets, just for this purpose. For this base, I used a couple of stabilizing legs from the Man-O-War Siege Chariot for pipes and the bottom tabs from clear flight stands for random chunks of metal. Once I picked out everything I wanted, I glued them in place randomly around the base. 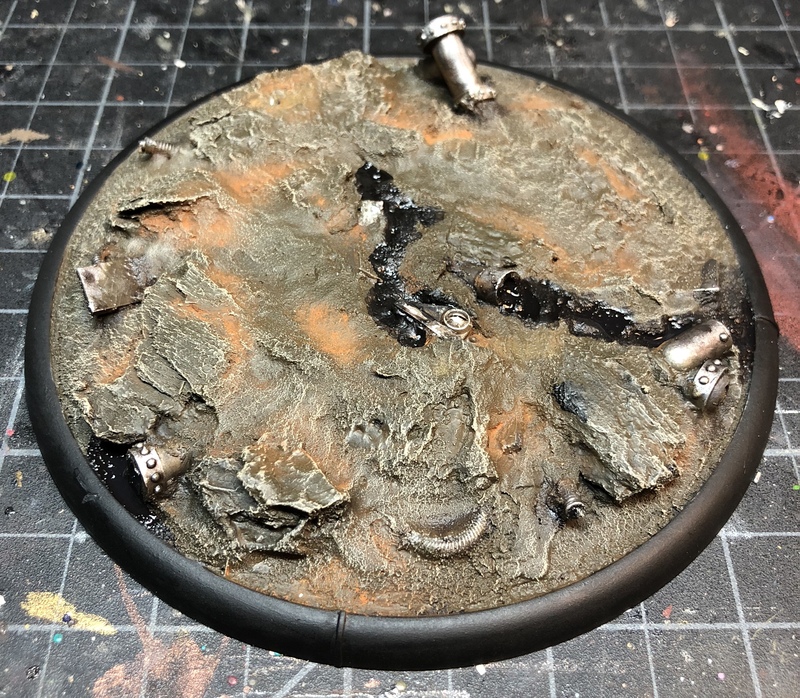 You can also use putty to both keep parts in place as they dry and build up the surface of your base. 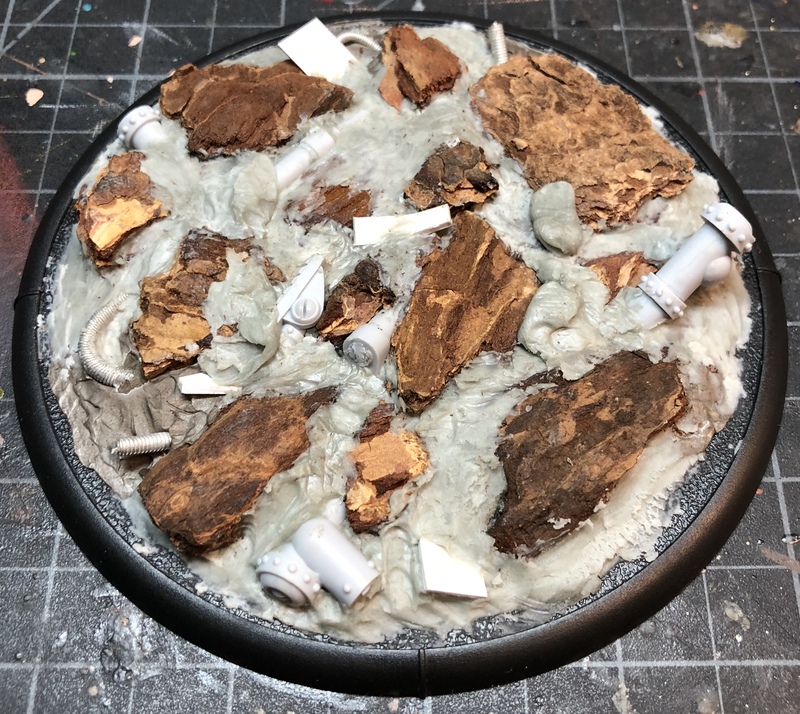 Now that we have a base with all of our bits and bark glued onto it, we need to take some putty and level that base out. 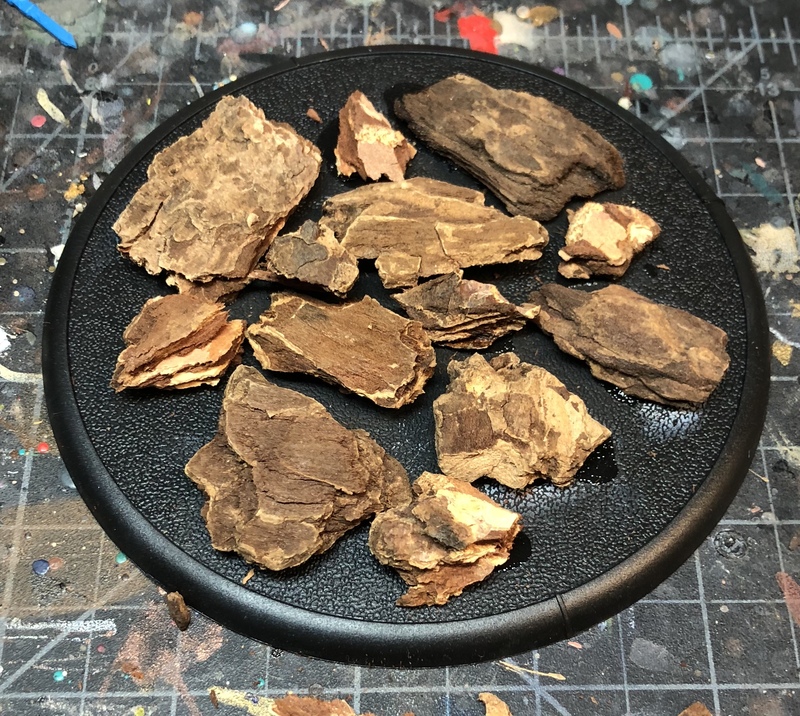 This will fill in any gaps between the bark and the extra bits while smoothing out the surface so it looks like everything is partially buried. 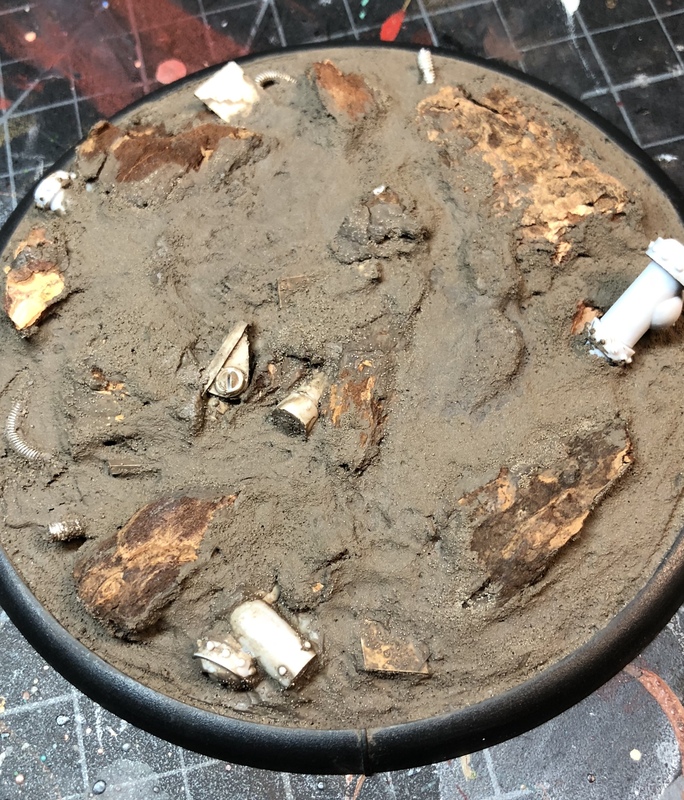 The last step is to cover the base in whatever basing material you prefer to use. I personally used a pumice gel, which has a much finer grain than most types of sand and can be spread like a fluffy paste. You want to cover most of the base but leave some of the bark exposed to maintain the rocky texture. All that’s left is to put on a coat of primer and paint it. And finally, here is the finished product! Thanks for checking out the P3 Hobby Blog this week! Stay tuned for my next entry—I’ll be painting the white on my Railless Interceptor!